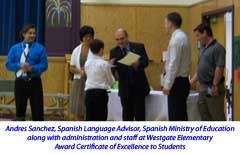 Congratulations to all of the Grade 4 students in the CBE’s Spanish Bilingual Program! For their dedication and completion of the first four years in the International Spanish Academy’s program the students were rewarded with a Certificate of Excellence from the Embassy of Spain in Canada and the Spanish Ministry of Education. The Edmonton public school system has a number of Spanish programs for kids. If your living in the Edmonton area and curious about the program you can read about their programs here. This is a bilingual program offering 50% of the instruction in Spanish and 50% in English. Currently they offer the program in three different schools. Instruction begins in Kindergarten and continues through grade 12. Normally children can only enter the program in Kindergarten or Grade 1. Further options are available for older students. They have a 3, 6 and 9 year Spanish language and culture program which start in grade 10, 7 and 4 respectively. For schools in the Edmonton area offering this program please visit their website. Our Spanish Bilingual Schools page tries to keep an up-to-date list of schools in Alberta.